Every woman desires to have glowing skin to make a good first impression and feel confident. There are a number of home remedies for glowing skin, which are easy to make at home using natural ingredients. They are safe to use that will leave the skin looking healthy and radiant. These remedies are not quick fixes, but require patience to see results. These two are my favorite ingredients. Mash a half banana and add 1 tablespoon of honey to form a smooth paste. Apply it to the face rubbing carefully in circular movements. Wash off after 15 minutes using cold water. Green Tea drinkers would be happy to know that tea leaves are great for glowing and younger looking skin. Boil 1 tablespoon of tea leaves or you can use tea bag, when the leaves impart color, remove from the fire. After cooling take 2 teaspoons of the water and add 2 teaspoons of brown sugar, 1 teaspoon of curd and mix to form a paste. Apply on the face and rub carefully in circular motions. Rinse thoroughly after 10 minutes using cool water. Sugar granules help to exfoliate the skin and lemon acts as a gentle bleaching agent. This combination leaves the skin feeling fresh and glowing. Take 2 teaspoons of sugar and add 2 teaspoons of lemon juice and mix well. Apply to the face and neck, rubbing carefully with circular motions. Rinse thoroughly with warm water after 10 minutes. Use this easy to make remedy once a week for glowing skin. Tomatoes are not only great to use in cooking, they also have antioxidant properties which help to make the skin glow and make it younger looking. Take a small ripe tomato and mash it up. Add ½ teaspoon of lemon juice to the mixture. Apply to the face and let it dry. Rinse thoroughly with cool water after 15 minutes. Use this easy remedy once a week for glowing skin. This is a scrub that can be used for all skin types. Take 1 teaspoon of honey and add to 2 teaspoons of oatmeal and 2 teaspoons of milk to form a smooth paste. Apply to the face rubbing gently in circular motions. After 15 minutes use warm water to rinse off. 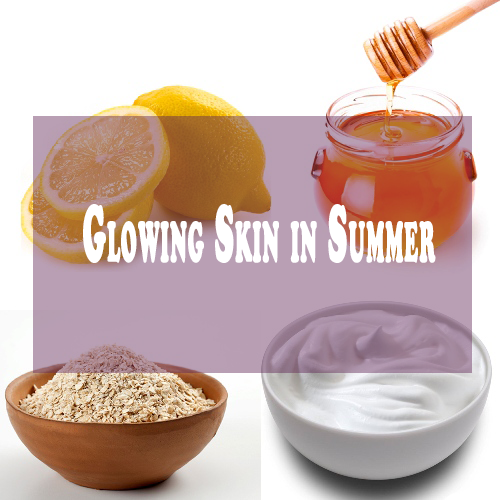 This easy to make remedy can be used every night form 3 to 4 weeks for naturally glowing skin. I hope you enjoyed my tips. I have tried all of these packs and believe me these are truly effective in Summer. If you have any other tips then you can share with me in the below comment section. Thank you! For sharing the information, there are so many remedies to make my skin glow. I will surely follow these remedies for a summer ready skin. Brilliant. Thanks for sharing these tips. hi frnd,The mastani facr pack is best product for glowing skin .tjis prouct gives our skin natural look and shiny .It removes the problems of pimples and other skin related problems. Herbs like Pudina, Chandan, Multani Mitti, Kappor are the best agents for fighting bacteria, smoothening skin and for giving extra- ordinary skin. Mastani Face Pack is a natural face pack for fairness. Relatively it gathers the beautiful healing choice from ancient ayurvedic formula. This Face Pack is made from 19 herbs altogether which has the most credentials in the market. Mastani Hair oil is unique Indian ayurvedic hair oil which prevents hair loss, hair disorders and other hair growth problems. The product is very useful for all types of hair as the roots lies deep in ayurveda and is very effective for the scalp. This product is designed to fulfill the cost for lost hair for which you would have done the expensive treatments like laser therapy or other. A beautiful house is the most covetous thing a person can ask for; luxury and comfort become the essential aspects of this home and the things that constitute this surreal look hold a high value. home decor pieces, whether conventional or contemporary, rule the interior of the house and make it into a place that carries an exotic look.